Nestled in Accra’s prestigious and most exclusive neighbourhood, Airport West, the African Regent Hotel is famed for establishing itself as the Ghanaian capital’s first luxury African and cosmopolitan boutique hotel. The preferred destination of savvy locals and sophisticated travellers alike, the hotel is a desirable location for business, entertainment, socialising and relaxation. This hospitality icon was set up eight years ago, creating a brand that highlights the very finest elements of African culture and draws particular attention to the most stylish features that can be found in Ghana and beyond. This attention to unique details is echoed in the African Regent Hotel’s tagline: ‘simply afropolitan’. The hotel exterior is purposefully unadorned, offering a stunning contrast against an interior that delicately incorporates elements of the design trends and styles that are visible across Africa today. 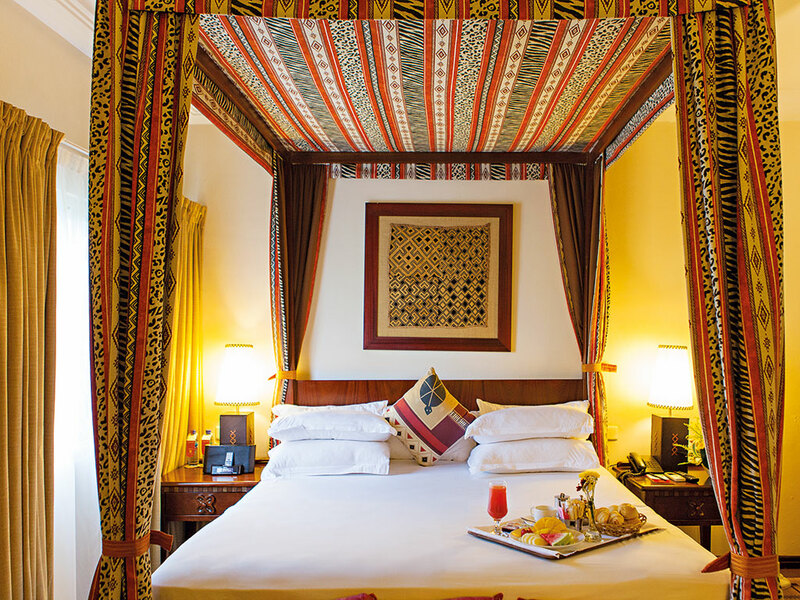 Guests can feel the strong but sublime African influence in the art, gastronomy and mixture of vibrant colours and subtle earth tones that are laced through the hotel. Ghana is a vibrant country, bustling with an exciting culture and a rich historical background. Its history dates back to the medieval days of slave trade, when the country was known as the Gold Coast to the various traders who made Africa their destination for a series of commodities, including gold, ivory, spices and manpower. In recent times, this trend has seen a turnaround following the discovery of oil reserves in the area, with manpower now mostly being imported into this specialised sector. Multinational companies such as Tullow, Eni, Chase Petroleum and Kosmos Energy are now operating exclusively from Ghana, with offices in both of the country’s harbour cities, Accra and Takoradi. The rapidly expanding economy and a burgeoning middle class have contributed to a booming economy, resulting in a significant tourism boost and the subsequent introduction of several key international hotel chains and brands. Accra’s population of almost four million people, who are known worldwide for their warmth and hospitality, has helped to accommodate this increase in international presence. The African Regent Hotel boasts 109 modern and elegantly decorated rooms and suites, with a series of state-of-the-art business and leisure facilities designed to accommodate any kind of traveller. Many of the rooms offer spectacular views, including those of the neighbouring Villagio Vista luxury properties, which have been designed to resemble an intricately woven ‘kente’ (the rich traditional cloth of Ghana). Inside the hotel itself, guests can enjoy a variety of continental and eclectic cuisines from across the globe at the world-class Mukyia restaurant. This eatery serves delicious themed buffets for breakfast, lunch and dinner every day of the week. The stunning hotel is located only a five-minute drive from Kotoka International Airport and a five-minute walk from Ghana’s first and leading shopping mall, Accra Mall. For sports enthusiasts, the African Regent Hotel is also situated only a few minutes away from the Polo Grounds, and is a 10-minute drive to the Achimota golf course. For visiting artists and art collectors, the hotel itself offers a spectacular art exhibition that showcases the works of local painters, while a stroll through the nearby Tetteh Quarshie interchange will lead visitors to the local flea market, which comes alive every day with new artworks and the bustle of Ghanaian locals. The hotel’s unfailing ability to balance service with style has been the key to its success, resulting in it continuously setting the highest standard among hotels of its kind and thus being the recipient of a number of accolades, both nationally and internationally: these awards include the CIMG Hospitality Facility of the Year award in both 2009 and 2013; the International Diamond Prize for Excellence in Quality, 2012; and the Business Initiative Directions’ International Quality Crown award. It is also the only CNN Partner Hotel in Ghana, and additionally has been voted one of the top 20 hotels in West Africa by Africa Travel Quarterly.